What happens if there’s a hurricane while you’re at Disney World? Florida hurricane season runs from the beginning of June through the end of November. If you’re planning a trip to Disney World during that time, there’s always a chance a hurricane can impact your trip. If you haven’t left for your trip yet, should you cancel your trip? If you haven’t left for your trip yet, can you cancel it without losing money? Is it safe to be in Orlando during a hurricane? If a hurricane happens, will it ruin your trip? If your home is in the path of a hurricane, would you be better off riding it out at Disney World? This article should give you the information you need to answer these questions and to decide what to do. That’s what we did. We live in the Fort Lauderdale area, where hurricane Irma was projected to plow through as a category 5. This would have been capable of destroying our home. 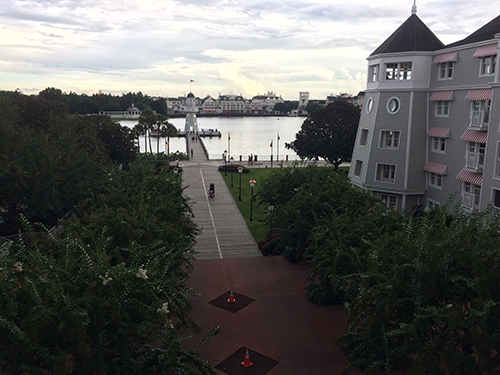 We decided to flee our area to ride out hurricane Irma at Disney World’s Yacht Club Resort. We have now had a first hand look at what happens at Disney World when a hurricane hits. Disney World is the first park to be certified under the StormReady® program. It’s one of only 70 StormReady designations given in Florida. According to the NOAA National Weather Service organization, Walt Disney World has an Emergency Operations Center, and they have a formal hazardous weather plan which includes severe weather training for their people. Disney has extensive plans in place to prepare for hurricanes and to care for guests. When we were at Disney World for Hurricane Irma recently, we saw some of those plans in action. Clearly Disney had incredibly well thought out and detailed plans in place for every phase of the storm. It was fantastic to see the highly coordinated and planned storm preparations move so smoothly, all while Disney was catering to guests. During and after the storm, the way Disney took care of it’s guests was nothing short of amazing. Disney was built knowing that they would be in the path of hurricanes. Disney resorts are built to handle weather. For example, we were told that the windows were impact resistant windows that could withstand hurricane force winds. Though Disney has weathered many hurricanes, it’s never had a hurricane hit that was completely devastating, and they’ve been able to keep guests safe, recover quickly and continue entertaining guests. However it’s important to note that it’s possible they could be hit with something more destructive in the future. Disney is inland. It’s approximately 66 miles to Cocoa Beach on the east coast, and 95 miles to New Port Richey on the West coast. This means there would not be any ocean storm surge flooding in Disney World, and depending on the path of the hurricane, the wind may have a chance to weaken over land before it gets to the Disney area. Before, during and after a hurricane, parks may close or modify their hours, and some attractions may be closed or different. During our trip, as a result of hurricane Irma, Disney closed it’s parks for two days. This included the day and evening of the hurricane, and the following day. After that, Disney went back to normal hours. Certain things were modified the next day. For example there was an attraction closed in one of the parks, and there were far fewer fireworks during the Hollywood Studios night time show. Pets (and Allergy alert) – To help with evacuation from hurricane Irma, Disney was asked by the Governor of Florida to allow pets into the resort. Dogs were visible almost everywhere! They were required to be on a leash at all times, and were not allowed in certain places such as restaurants. We don’t know whether or not they’ll be allowed during every Florida hurricane. To go or not to go to Disney World when you know a hurricane is coming – that is the question. The crowds in the parks were incredibly low just before and after hurricane Irma. After Irma, we were able to walk onto rides with no wait. Years ago we went to Disney just after another hurricane and we found the same thing. The parks were so quiet. Also I’m sure there are those who are adventurous and like the idea of experiencing a hurricane. We lost two days of enjoying the parks, however there’s no guarantee that this is all you would lose. We had to go through a hurricane. Although it was actually kind of cool, these storms are unpredictable. There can be tornadoes, and the weather could do damage. Our car was scratched. We had to leave it in an outdoor lot during the storm. Cancelling your trip to Disney World because of a hurricane. So can you cancel or reschedule your Disney World vacation without any fees or penalties? The short version is that if a hurricane warning is issued within 7 days of your scheduled arrival date for the Disney World area or for your home area, you can reschedule or cancel your Walt Disney Travel Company Magic Your Way vacation package and most room only reservations without any fees. However that’s only if you booked directly with Disney, and this doesn’t apply to third-party suppliers like airlines, car rental companies, etc. If you’re planning to visit Disney World during hurricane season, trip insurance might be a really great investment. Consider that airlines could cancel flights, car rental agencies could close down, and traffic could become severe because of people evacuating to Orlando, or in or out of Florida. Before Irma, our car ride into Orlando that normally takes 3 1/2 hours was 11 hours long because of the evacuation. We stayed at Disney for several days after Irma to allow traffic to ease. As a hurricane approaches, the Disney staff will begin making preparations. Even while guests are enjoying the parks and resorts, you’ll see Cast Members removing, covering or tying down objects outside throughout Disney World, such as furniture and decorative objects. Guests staying in the Treehouse Villas of Disney Saratoga Springs Resort, and those staying in the Fort Wilderness resort cabins will be moved to another resort. Guests in tents must also leave the campground and are given the option to be put in another resort. Those with RV’s must remove their vehicles, and are encouraged to drive out of the hurricane zone to protect their RV’s. All of the above guests may have the option of staying in another Disney resort. Cancellations of things like dinner shows and special events will be announced. If Disney will be closing the parks, they’ll make an announcement. Of course how long the parks will be closed for will ultimately depend on the damage done by the hurricane. Disney World transportation will stop before the hurricane hits. If you’ve brought a vehicle, and you cherish it, you may wish to strategically park it in an area away from trees, signage, and buildings with shingles. You also may wish to park between two other vehicles to allow for less debris to directly impact the car. This gives you the best chance of still having a workable vehicle when you’re ready to leave the area. Lastly, I’d suggest you top off your tank if at all possible, because there may be a fuel shortage immediately after a storm. The above video shows the view from our window during the beginning of hurricane Irma. Though it’s dark, you should be able to get a sense of the wind. You can see the lamp posts and trees swaying on the left of the screen, and you can hear the sound of the wind. It got significantly worse, but we were not able to open the door to get video as it worsened. During a hurricane, If you’re in a resort that has indoor hallways, you’ll most likely be able to move around the resort during the hurricane. 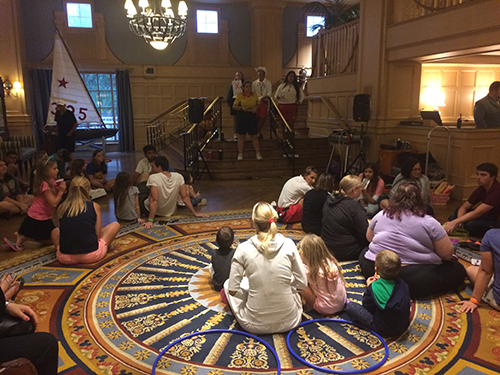 On our recent visit, Disney had characters in the main lobby, and Cast Members ran party activities for the children. In our room there was non-stop free Disney movies playing. The above video was taken in the Yacht Club lobby just before hurricane Irma, in 2017. Guests mingle with Chip and Dale, even the canine guests. If you’re in a resort with outdoor corridors, there will come a point where Disney will instruct you to stay in your room. You’ll need to go through the hurricane inside your room, and you won’t be able to come out until the storm has passed. You’ll need to stock up on water and food for your room before the storm. Hurricane Irma hit at its worst in the middle of the night. Compared to riding this out in our home in the Fort Lauderdale area, we felt reasonably safe the entire time, though we slept in our clothing just in case we needed to move into the hallway. Since our home has hurricane shutters that you can’t see through, we were able to watch a hurricane for the first time, and it was kind of cool! Before the hurricane hit we spoke with several people from out of state who had never been through this before, and they were visibly frightened about what was to come. This did not necessarily make for their ideal vacation! Once the storm passes, you should be able to come out of your room, assuming there are no dangerous situations. In our experience, Disney continued to provide entertainment for the children in the lobby. They also provided food for purchase, though choices were more limited than normal. They took care of my wife’s special dietary needs throughout the experience. The day after the hurricane, Disney begins the work of removing debris, putting things back to normal, and making repairs. On our visit, there were many trees down, and you could see some minor damage such as roof shingles missing. Also all Disney transportation was down and parks were closed. If your home is in the path of a hurricane, should you flee to Disney World? We never lost power, but if we had, Disney has generators and we were told that we would have had at least some power, including air conditioning. We felt comparatively safer in the Disney resort building. 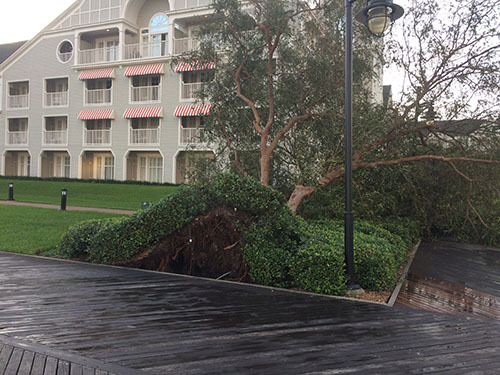 Disney cast members assured us that the Disney resorts are built to handle strong weather. For example, we were told that the windows were impact resistant windows. Disney is inland. As discussed above, this has its advantages. Disney takes care of their guests. In fact, we felt very well taken care of. Disney has measures in place to keep guests safe, fed, comfortable, and cared for in various ways. Kids were having the time of their life. Rather than this becoming a trauma, Disney provided so much entertainment for the kids that we repeatedly heard that the experience was a blast for them. So should you cancel your Disney trip? Or should you go anyway? That will depend on you. Please be sure to read the above carefully, and be aware that Disney can change anything at any time. Your experience may be different than mine. So if you have any questions, concerns or special needs, be sure to call Disney in advance. You’ll want to do that as soon as you can if a storm is announced, because Disney can become overwhelmed with calls when a storm is approaching, creating long wait times. Also join our facebook group!!!! Ask any questions, share your knowledge and just enjoy getting to know other Disney fanatics in our FACEBOOK GROUP: Walt Disney World Made Easy for Everyone. Also: Like our FACEBOOK DISNEY NEWS PAGE too for breaking Disney news. Sign up below to stay updated on the newest information, tips and tricks to help you plan your perfect Disney World trip! 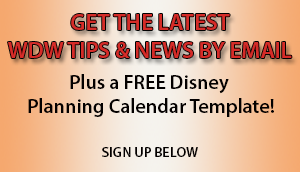 You’ll also get a free Disney World Trip Planning Calendar Form to help you plan your trip, with info on what you’ll need to include on your Trip Calendar. This will help make it easy for you to organize and plan the best best trip possible! One warning for those needing coffee. I was All star movies and since there was a curfew in place until 6pm they would not open the food court to deter people from leaving their rooms. It did not work and many people were standing outside the food court With mugs in hand and scawls on their faces.